I am privileged to have had many woman in my life who have guided me and shaped me and made me who I am. Today I would like to acknowledge the life lessons taught by my maternal grandmother – Olive Hanson. My granny passed away in 1978, when I was 13, I may have been young but I have remembered she taught me some great lessons. My granny was born Olive Pickavance (I do like that name) and was one of 10 children, 5 boys and 5 girls. All the girls had names of plants – Olive, Iris, May, Hazel and Violet. My granny was a lady, and one with a sharp wit. I have fond memories of staying over at my grandparents on a Friday evening. We went to sleep with a huge sense of anticipation of the adventure the next day. My grandfather brought us tea in bed, something that didn’t happen at home. We got up and got dressed with our frilly knee socks and black patent shoes and got ready to ride the bus to town. Saturday morning in town meant a visit to the hairdresser for my gran (a proud supporter of the blue rinse) and then a visit to the multi-storied department stores which have now disappeared. The excitement of tea and scones in the tea room and a little purchase or some kind meant we returned home on a high. These trips were the ignited a passion for independence which had me riding the busses for many years. At 16 I rode the bus into town and secured myself a job selling children’s shoes. 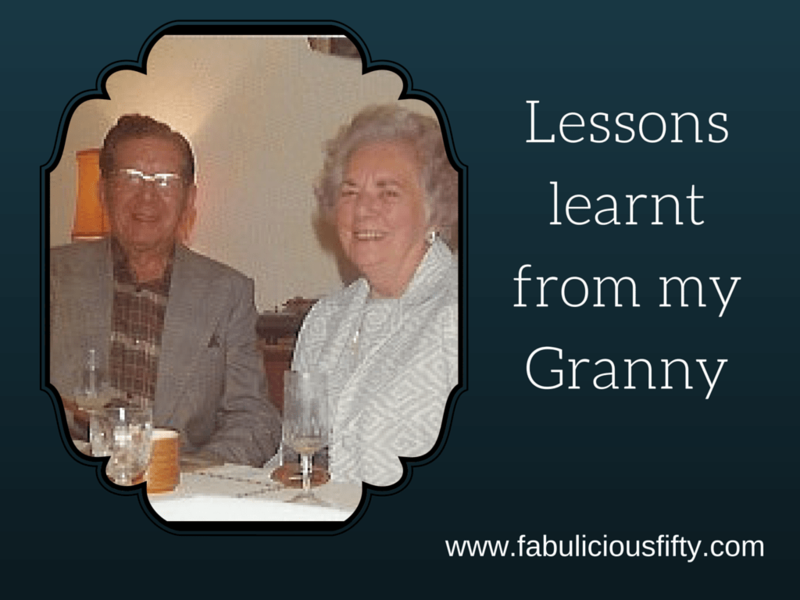 Here are a few great life lessons I learnt from my Granny. You are never too old to learn. Granny learnt to drive at 63 before my Grandad passed away. I think it is fair to say that she was never a great driver but it didn’t stop her getting around. My little sister always maintained she could hear Granny arriving. The importance of underwear. Granny always maintained that you should have good undies in case you were ever in an accident. Years later I was in an accident and found myself lying in the ambulance trying to remember what I had put on in the morning. Luckily I was ok! The need for walking shoes and sitting down shoes. As a young child I couldn’t understand what Granny meant when she talked about sitting down shoes. Now I know exactly what she meant. I have both types on my shoe rack. The importance of being well dressed. Granny was always elegant and well dressed. She valued her clothes and would spend a good deal of time choosing a piece of fabric that would then go off to the dress-maker. She also didn’t like black. The value of a social occasion. As she got older she often attended the funerals of her friends. She wore Navy and saw these occasions as not only an opportunity to pay her respects but also to socialise, a wise woman. She also loved a good wedding for the same reason. The value of occasion. She had a real sense of occasion. A tea-tray was set and cups and saucers and always a little something to nibble would be brought out for a visit after school. Making small things special. The importance of high standards. Always told her three daughters to put a price on themselves. It has been something I have never forgotten – the importance of valuing yourself – featured on my blog here. Her three daughters, my Mum, Aunty Ingrid and Aunty Elna were reminded – Remember you are a Hanson. Basically behave yourself and keep high standards. Everyone is special. Granny had a way about her that you always believed that the time she spent with you was special. A real gift that I hope I have inherited. My granny was born on 12 March – she would have been 109 on Saturday and probably still dishing out wisdom in the form of stories. I will set a tea-tray and sit down and raise a cup to Olive Hanson – thank you for the lessons you taught me Granny. « Life Audit: Where am I now? Thank you so much. Feedback means a lot to me.